Beginning with years of experimentation, different ingredients, combinations, distilling techniques and approaches, award-winning freelance broadcaster, producer and presenter Kathy Caton and her team finally found their perfect blend. One which embodies the spirit of Brighton; unusual, playful and fiercely independent. The Gin Guild talks to Kathy about the story behind Brighton Gin. The Gin Guild: Where did the Brighton Gin journey begin? 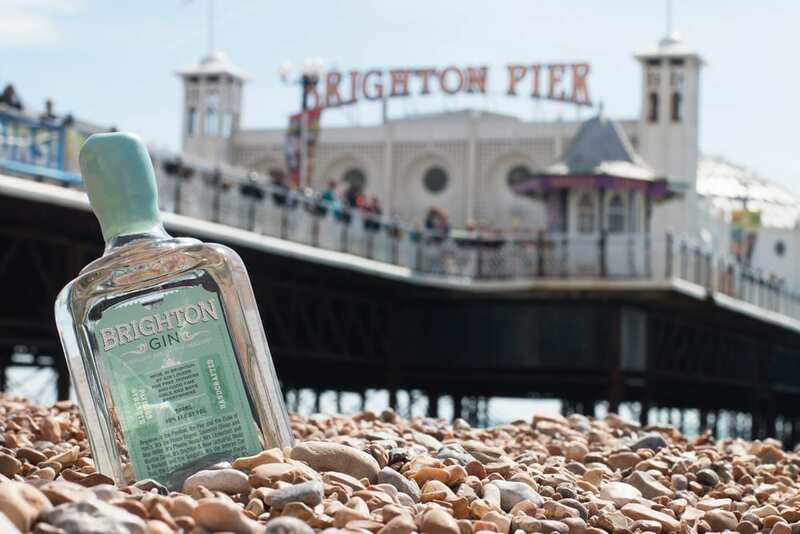 Kathy Caton: The idea for Brighton Gin came to me as an absolute light-bulb moment. I was out for a seafront run, the morning after a very late night on the gins (Plymouth Gin to be precise) dancing around a friend’s kitchen table – I got thinking that if I’d been drinking anything other than gin, I wouldn’t have been off my sofa, let alone going for a run! The light bulb moment was that (in my experience!) gin is the one drink that lets you get away with it. 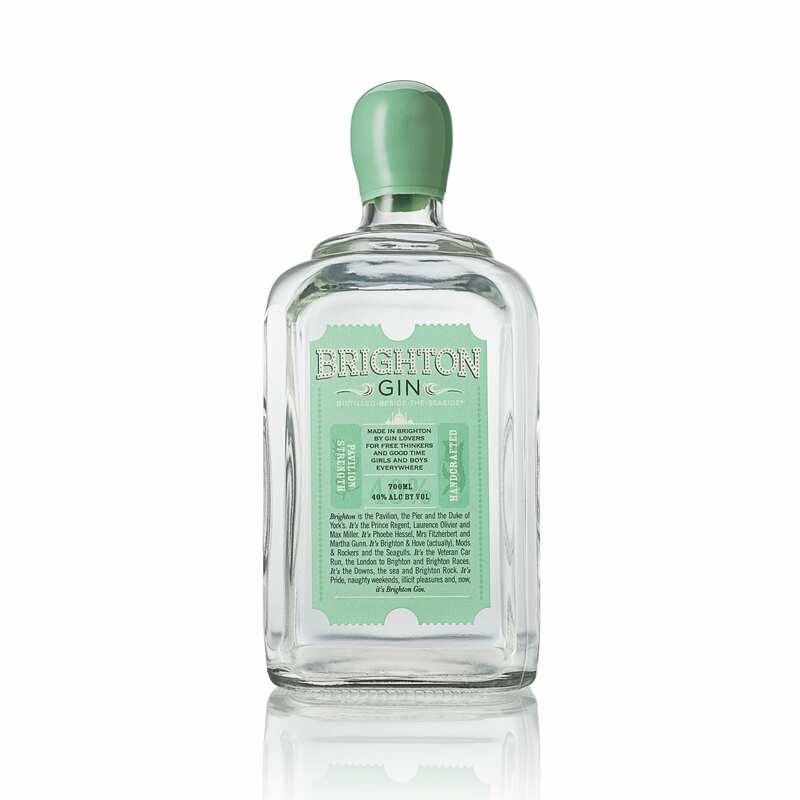 Brighton is a place that needs to get away with it on a frequent basis, and I thought ta da, the spirit of Brighton – Brighton needs its own gin. GG: Being an award-winning freelance broadcaster, producer and presenter, how do you find the time to make gin? Kathy: Gin takes precedence but I consider myself very, very lucky to be able to have my dual loves of radio and gin in my life. It’s amazing when they occasionally collide – such as getting involved in advising on The Archers’ craft gin story-line (my mum was proud!) – and I love doing my weekly community-focused show for BBC Sussex & Surrey. Mainly though it’s through not sleeping very much, working every hour and also having an absolutely brilliant team, they not only keep the good ship Brighton Gin afloat but make it (largely!) a joy to work here. GG: What are the advantages of producing gin beside the seaside? 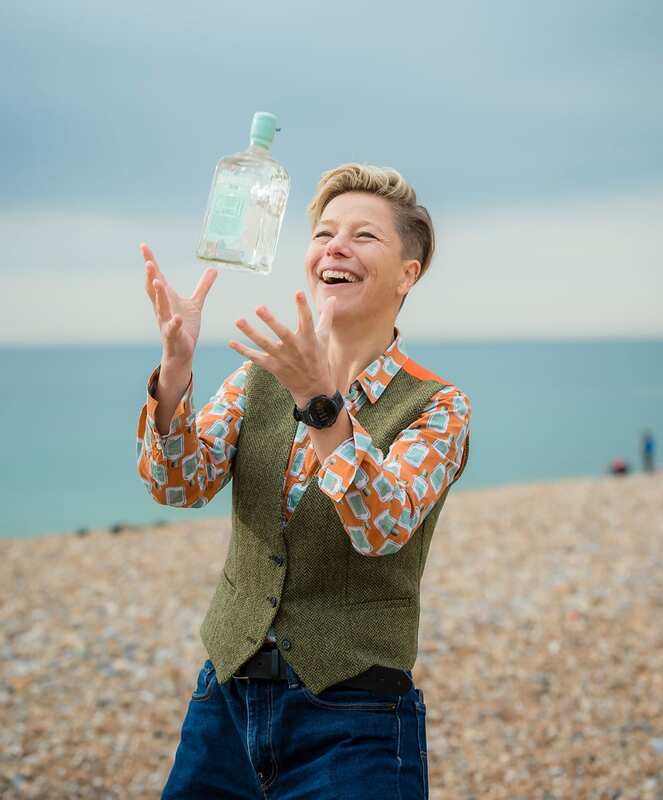 Kathy: Brighton Gin was born of a passion for gin, and a passion for the place where we live and play, we wanted to create a gin that personified the spirit of Brighton. This ethos is part of our core brand values; we are aiming to build an ethical, sustainable business for Brighton. We’re very proud that we’ve introduced a totally new manufacturing sector to the city, and our move in to export helps spread the name of ‘brand Brighton’ beyond our local and national borders. There’s a really rich heritage of brewing and more recently wine-making in this part of the country, but much less so on a distilling front – it’s been amazing to start something new for the city. There are enough pubs in Brighton to drink in a different one every day of the year, so this is a place that likes its booze and its partying! Aside from all this, what better way is there to enjoy a Brighton G&T than having it on the beach with some mates in the summer or snuggling up under a blanket with a flask of mulled Brighton Gin in winter? GG: How long did you spend perfecting your Brighton Gin recipe? Kathy: We spent a long time perfecting our recipe. It took about two years and was done around our kitchen tables, with many mistakes along the way that I’m not embarrassed to talk about as they’re such a key part of learning. Our early distillations were overwhelmingly strong and unbalanced and tasted like loo cleaner! We had a minor fire in the early days that needed to be patted out with my oven gloves, which then started smouldering themselves. My colleague Ellie then had a health and safety fit and rushed out to buy fire blankets and extinguishers! At the beginning we had a vast list of botanicals we wanted to use, but through the process of distilling and tasting them individually we whittled them down to our final recipe. GG: You have been working with Ellie since the outset and she is Chief Gin Peddler for the business – why did you choose this title? Kathy: Ellie was pretty much the first person to hear me banging on about wanting to make Brighton Gin eight years ago and it’s a delight to work with her every day. And the job title? Mainly because of the look on Ellie’s face when we discussed her being Head of Sales! GG: What are the main botanicals you use to give Brighton Gin its distinctive flavour? Kathy: Our initial vast list of botanicals has been whittled down to six, every one of which has earned its place in the bottle. We’ve created a gin that is smooth enough to be sipped neat and is certified vegan too, so it can be drunk with a clear conscience. Brighton Gin is made from 100% organic grain spirit, juniper, fresh orange and lime peel, locally-grown coriander seed, angelica and milk thistle, which is indigenous to the South Downs and renowned for its kindness to the liver function (albeit I have to legally say, most probably not when part of a gin!). GG: You have no factory production lines and bottles are filled by hand. How long does it take to produce a bottle of gin and how labour intensive is it? Kathy: That’s absolutely true, we do everything by hand from start to finish. The distillation itself takes a day, including hand-peeling fruit and crushing juniper and coriander. Once distilled and adjusted for ABV we rest the gin for a minimum of 24 hours before tasting and signing off. Every bottle is washed, filled, corked, and waxed by hand before being labelled (lined by sight) and packed. At the beginning we worried about our bottles not being identical and not looking like they’d rolled off a bottling line, but we have become very proud of that hand-made quality. As a hand-crafted product that takes time and a lot of hands to make, our focus is on quality and consistency, not volume. It’s a labour-intensive production method but we’re proud of it. It’s also keeping my mum St Jude gainfully employed and out of trouble! GG: How are you benefiting from the gin boom? Kathy: There’s a couple of factors influencing the gin boom – one is the interest in provenance, quality and localism which was led by craft brewing. What’s happening in craft spirits is following that. With gin, additionally, I think there’s so much room within the category, an infinite variety of botanicals and combinations, the different methods you can use. There are several thousand gins worldwide now, but I’m hoping there’s room for everyone. I also love that gin is now enjoyed across the gender and age spectrum. When I was at university, a hundred years ago, I was laughed at for drinking gin as “that’s my nan’s drink”. It’s now enjoyed across the generations, all drinking it in different ways, and it doesn’t have that perceived gender barrier that, say, single malt whisky does. It’s accessible, approachable, with tons of room for innovation and creativity. Also, fundamentally delicious. I love that our conversations with consumers have evolved – five years ago they were about persuading people to try it neat, now people ask straight away about distillation methods and botanicals. What’s your favourite way to enjoy Brighton Gin? I absolutely love Brighton Gin, neat over ice, sipped slowly. As a long drink, I like it paired with soda or a naturally light tonic. When it comes to cocktails, I love a Brighton Gin Negroni or a Sussex 75, our riff on a French 75 but using Brighton Gin and Sussex sparkling wine, joy in a glass and gets any party going with a bang! We’ve got so many exciting plans for 2019 – we’re releasing our new Seaside Strength, it’s our Navy Gin and is Brighton Gin turned up to 11. We’re really looking forward to getting cracking working with our new UK distributor Love Drinks to help take Brighton Gin nationwide, and we’ve lots of exciting export plans too – we want to take the spirit of Brighton to the world!